Mathematics for the General Course in Engineering covers the syllabus in mathematics for the general course in engineering. Topics covered deal with arithmetic, logarithms, and mensuration, along with algebra, geometry, and trigonometry. Examples and the corresponding answers are given at the end of each chapter. This volume is comprised of six chapters and begins with an introduction to arithmetic, with emphasis on how to compute fractions, decimals, averages, ratio, percentages, reciprocals, squares and square roots, and errors. The next chapter deals with logarithms and considers positive and negative numbers, the use of brackets, and indices as well as the laws of logarithms and the use of logarithms in calculations. Subsequent chapters focus on mensuration (right prism, oblique prism, sphere, average-area rule, etc. ); algebra (signs, maxima and minima, graphical solution of equations, etc. ), geometry (angles, intersecting chords, radians, etc. ), and trigonometry (special angles, identities, sine rule, cosine rule, etc.). 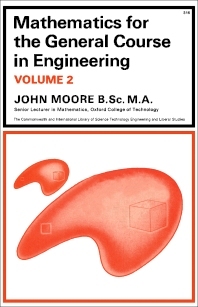 This book will be a useful resource for students of mathematics and engineering. University of North Colorado, Greeley, U.S.A.